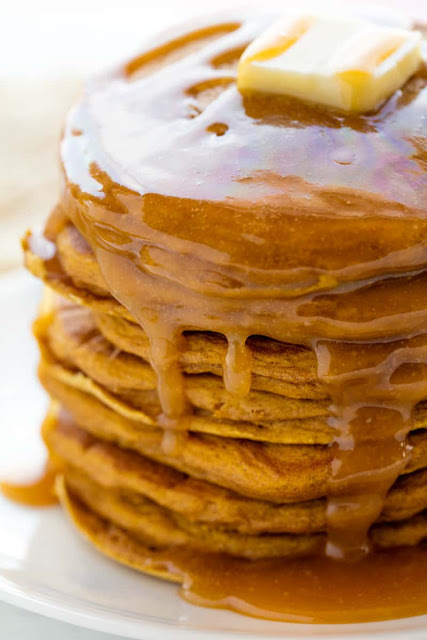 Perfect Pumpkin Pancakes that are easy to make and taste just like pumpkin pie! Yes! Blueberries or chocolate chips can be folded into the pancake batter, or you can add them in after you scoop the batter onto a griddle to form designs or patterns. Use up to 1/2 cup of either blueberries or semi-sweet chocolate chips in this recipe. In a large mixing bowl, whisk together buttermilk, pumpkin puree, egg, and vanilla extract. Stir in brown sugar, baking powder, baking soda, cinnamon, nutmeg, ginger, and cloves until combined. Stir in flour until no lumps remain. Heat a non-stick skillet or griddle over medium-high heat. Lightly oil with a non-stick cooking spray or butter. Working in batches, scoop about ¼ cup of the batter on to the hot griddle. When bubbles form on top of pancake, use a spatula to flip the pancakes. Cook until both sides are browned and pancake is cooked through. 0 Response to "PERFECT PUMPKIN PANCAKES"